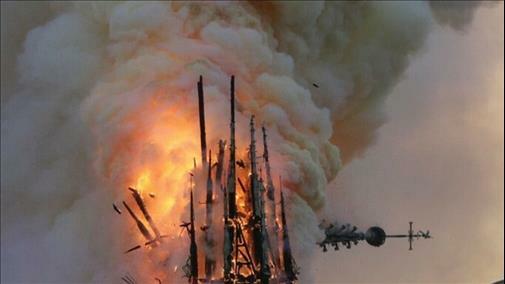 (MENAFN - Newsroom Panama) Panamanians were among the last visitors to leave Notre Dame Cathedral before it was engulfed in flame on Monday, April 15; Maylin Bolivar and her husband, Wiley Leaws, and their parents who were visiting left the 850-year-old cathedral some two hours before the fire started. "We began the visit at two in the afternoon. We went around the cathedral and then we visited the Gothic church of Sainte-Chapelle, which is about 100 meters away, "Maylin Bolivar said "The visit ended around 4:00 p.m.," her husband adds. They even took a photo with the workers who were working on the restoration in the area where the flames apparently originated. Only when they were in a restaurant did they begin to see the dense smoke and people running by. The fire started around 6:50 pm. A few minutes later hundreds of tourists and French crowded the two banks of the Seine while recording the Dantesque scene with their phones. "When we saw that the smoke was getting thicker and that it did not stop, I started searching the Internet for what was happening. When we found out we went to see the fire. I was already cordoned off. They did not let pass until a certain distance. we saw the cathedral that we had visited a few hours before burning. It gave us pain and sadness€ to see it burn. It was very hard. "recalls Maylin. President Juan Carlos Varela joined other world leaders in expressing regret about the fire in one of the most iconic buildings in the world and the most visited in France. "I see with sadness the images of the fire in the Cathedral of Notre Dame in Paris, without a doubt we lose one of the most beautiful Cathedrals, cultural heritage of the world that took 200 years to build Our solidarity is with the French people and the Pdte. @Emmanuel Macron ", Tweeted Varela.